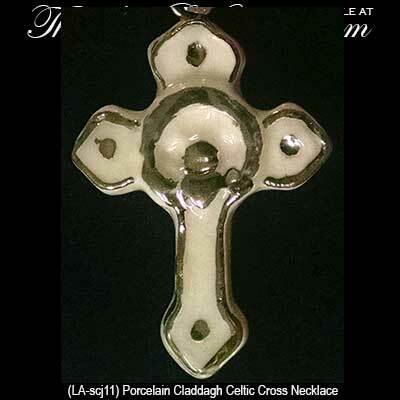 This porcelain Celtic cross necklace features the Irish Claddagh in the center. This porcelain Claddagh Celtic Cross necklace, with hand painted accents, measures 3/4" wide x 1 1/8" tall and includes a 16" long silver tone chain. 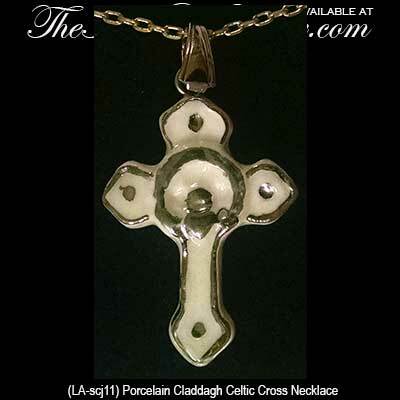 The Irish costume jewelry is made in Ireland by Liffey Artefacts and is gift boxed with Claddagh and Celtic cross history cards, complements of The Irish Gift House.